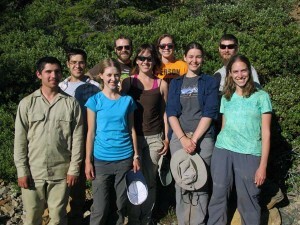 In late August/early September, we spent two weeks in northern California and southeastern Oregon, looking at ultramafics in the Trinity Ophiolite (CA) and Josephine Peridotite (OR). This trip was part of a Stanford field class, GES 190: Advanced Field Methods, and the students blogged about their experience here. 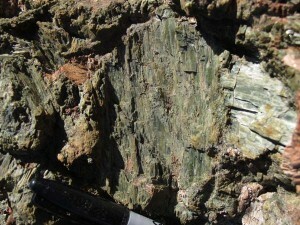 Large clinopyroxene in a clinopyroxenite vein in the Trinity Peridotite. Sharpie marker at bottom for scale. 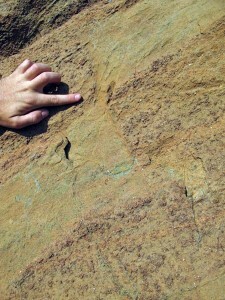 Small shear zone in the Josephine Peridotite. Offset is observed in the inter-layered harzburgite/dunite.